Tests of a drone to deliver medicine to an island in Lake Victoria in Tanzania have concluded successfully, according to DHL. 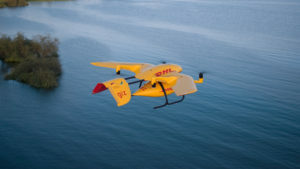 The DHL Parcelcopter completed the 60km flight from the mainland in an average of 40 minutes. Over the course of the six month test, there were a total of 180 take-offs and landings and 2,200km were flown. Some 400,000 people live in Ukerewe island district, but poor infrastructure and difficult terrain mean that it takes six hours to deliver medical supplies overland – a distance of 240 km. That makes it nearly impossible to provide emergency medication or to quickly refill cool chain commodities that are out of stock. DHL said the Parcelcopter 4.0 barely needs any infrastructure as it takes off and lands vertically. After delivering its cargo, it can be loaded with blood and laboratory samples to take back to the mainland.